The Domestic Doozie: Needle Book Tutorial~With Free Template! This post is so photo heavy! I apologize in advance but hopefully all the pictures will answer all of your questions! 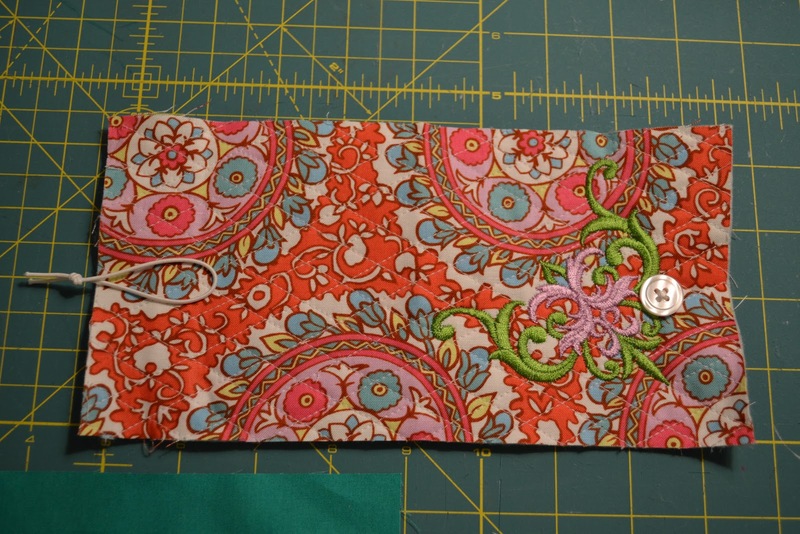 Fold your pocket fabric in half lengthwise and sew down the creased side. That way your pocket looks good from the outside and the inside. I ended up doing a diamond pattern and then played around with some embroidery. 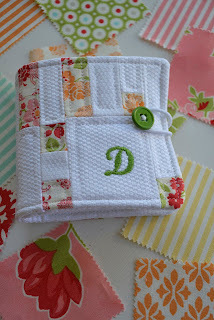 Try stitching your initials, add ribbon or ricrac. Make it yours! 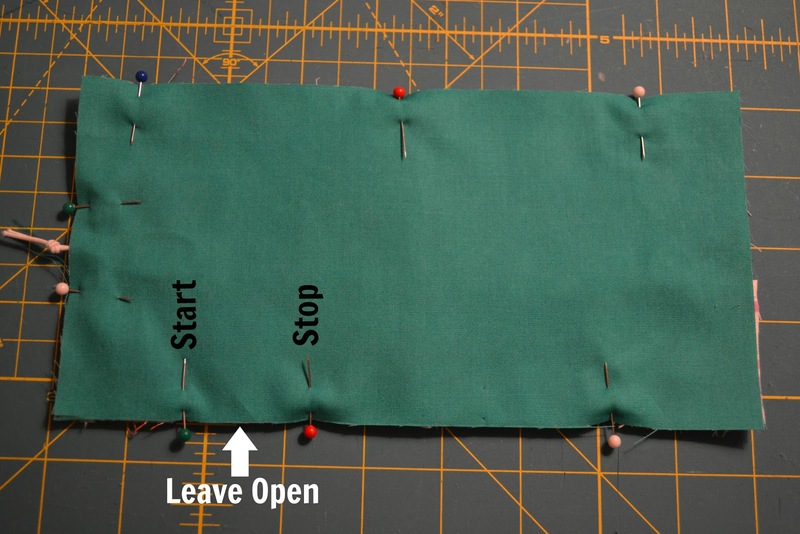 Sew your button on the right hand side about an inch in from the side. Tie a knot in your elastic. Place loop facing in on the left side. Lay your pocket on top. MAKE SURE THE RAW EDGE IS ON BOTTOM. You'll cry if you don't. Lay your inside fabric on top of the stack. If it has a print, make sure the print is facing the inside of the sandwich, NOT you. 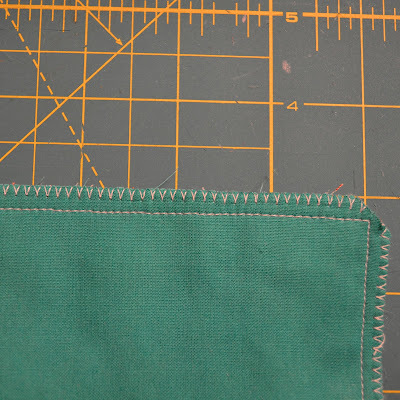 And then sew a 1/4 inch seam all the way around, making sure to leave an opening. 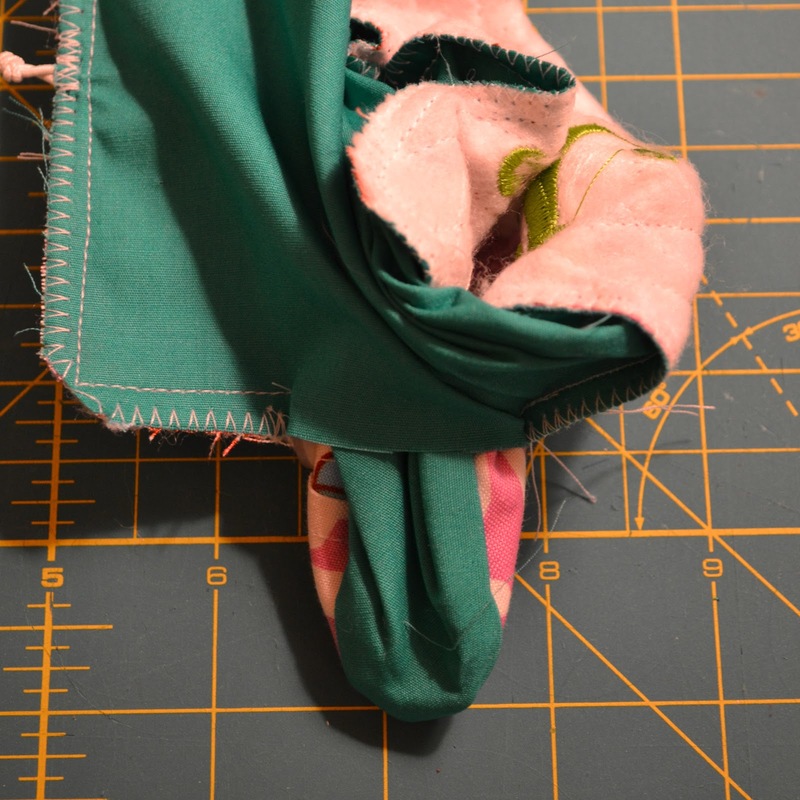 Once sewn, snip your corners. This step is optional but to make it sturdy you can serge the edge. The easiest way to do this is set your machine on a zigzag stitch and let the needle only catch the side of the fabric and fall off on the other half of the zag. 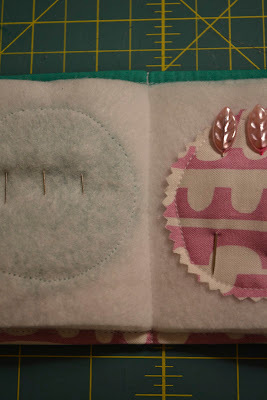 Pull your needle book right-side out. 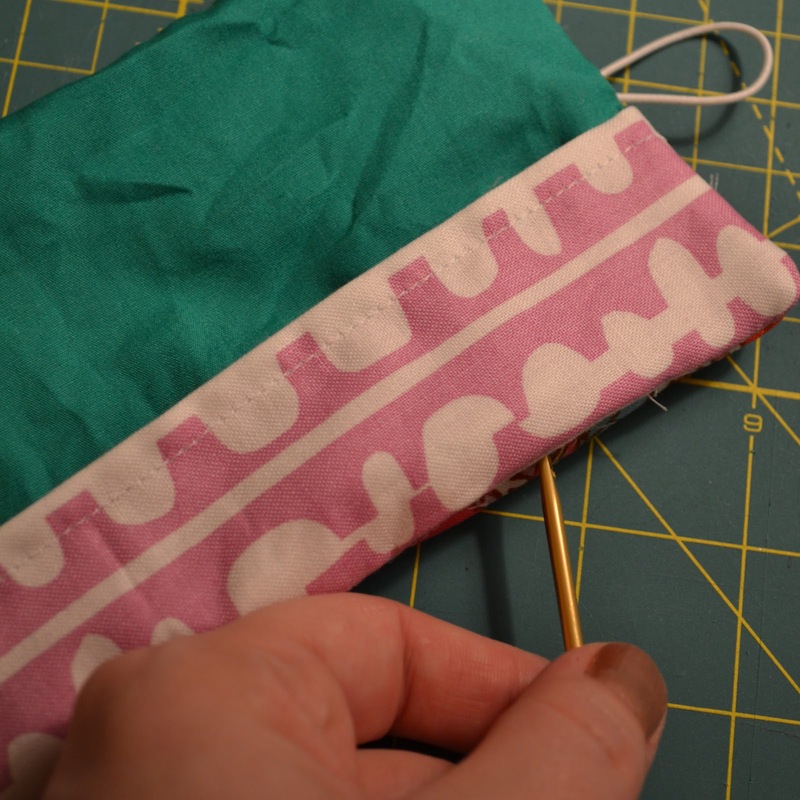 Use a pencil, crochet hook, bobby pin, whatever you like to poke the corners out. Iron the book nice and flat, tucking in the opening flap to match the seam. 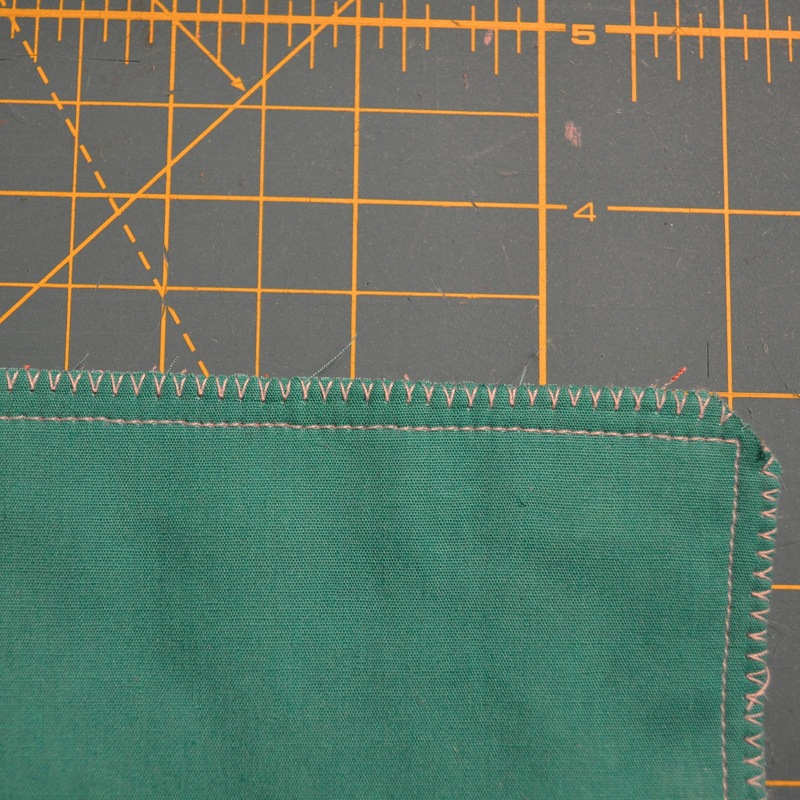 Do a 1/4inch top stitch all around the edge of the needle book. This will sew up your opening and give the book a nice, clean look. 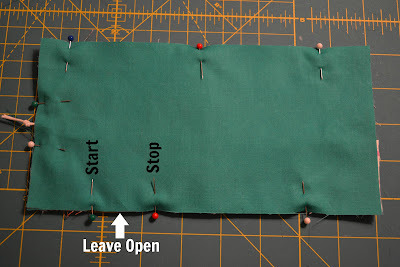 Cut your felt to 3 1/2 inch by 7 inch strips. I had 3 strips total. Embellish them any way you like. I cut 2 1/2 inch circles and sewed them on. and sew down the center. I made the one below the exact same way. 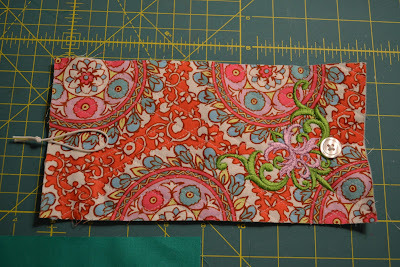 Only for the cover fabric I pieced scraps together for a quilted look. I just kept sewing until I had a full piece of fabric the size of the template. And of course if you have any questions I am happy to answer them! Thank you so much for this KO, I actually think I will be able to follow along and create my own sewn needle case! Great directions and the photos are very helpful. OMG! Too cute. You really are a good seamstress. I cold learn a lot from you. What is the metal bar coming from the machine I see on the quilting pic? and...did you hand embroider that or use a machine? Oh that is totally machine embroidery! I wish I could do something like that by hand :) As for the little metal bar, you should have one in the bag of accessories that came with your Pfaff. It's a quilting guide and it slides into a little hole behind the foot and you can set it at whatever length you would like. 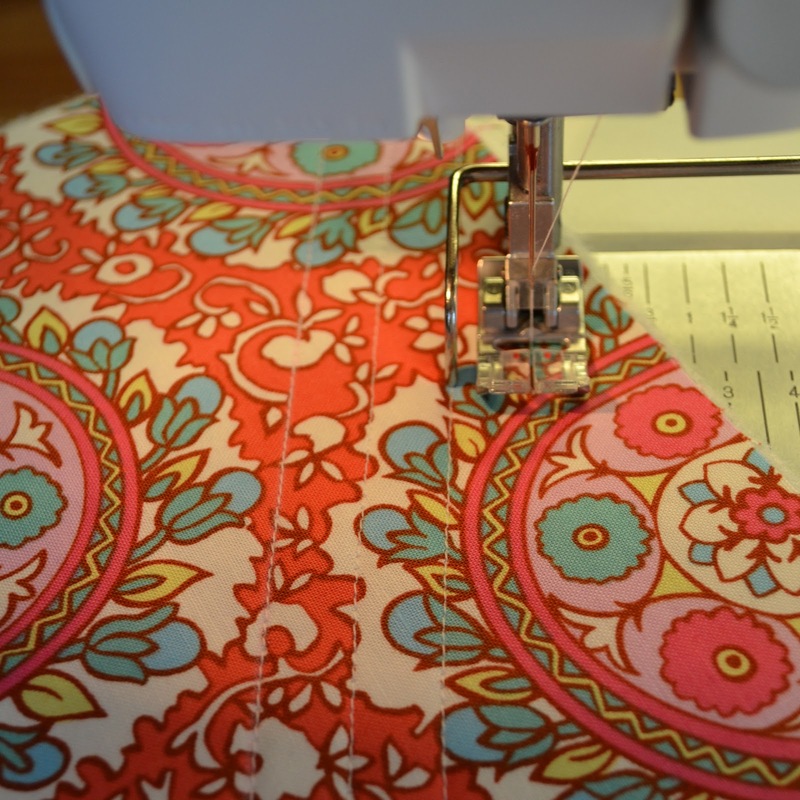 It is amazing for giving you nice straight quilting lines! 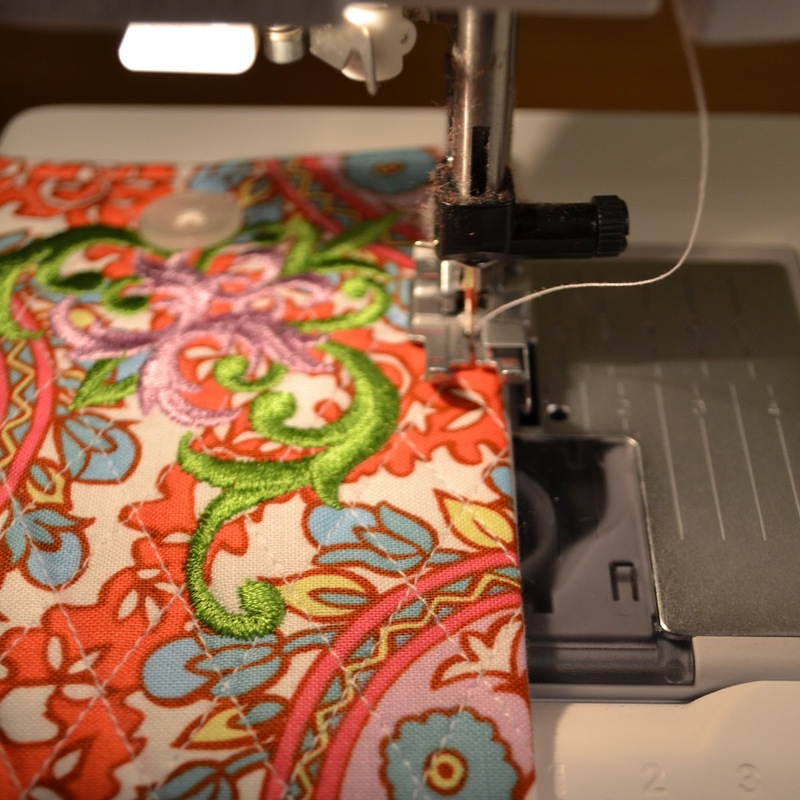 did you do the embroidery on your pfaff? GUESSING NOT! Great tutorial and a fabulous needle case!!! I love the little pocket for scissors... so handy. Hope you don't mind, but I'm pinning this. I really loved this tutorial... the pictures are great!!! An old friend gave me a pattern for a little folded needle/pin holder, I will send a picture if you are interested, it's sort of a circle that folds. Have you seen one? I love yours, and plan to make one for grandkids along with some pin cushions. Excellent tutorial, and there are never too many photos. This is high on my' to do for Christmas' list. Thank you for Sharing. Thanks so much for sharing! 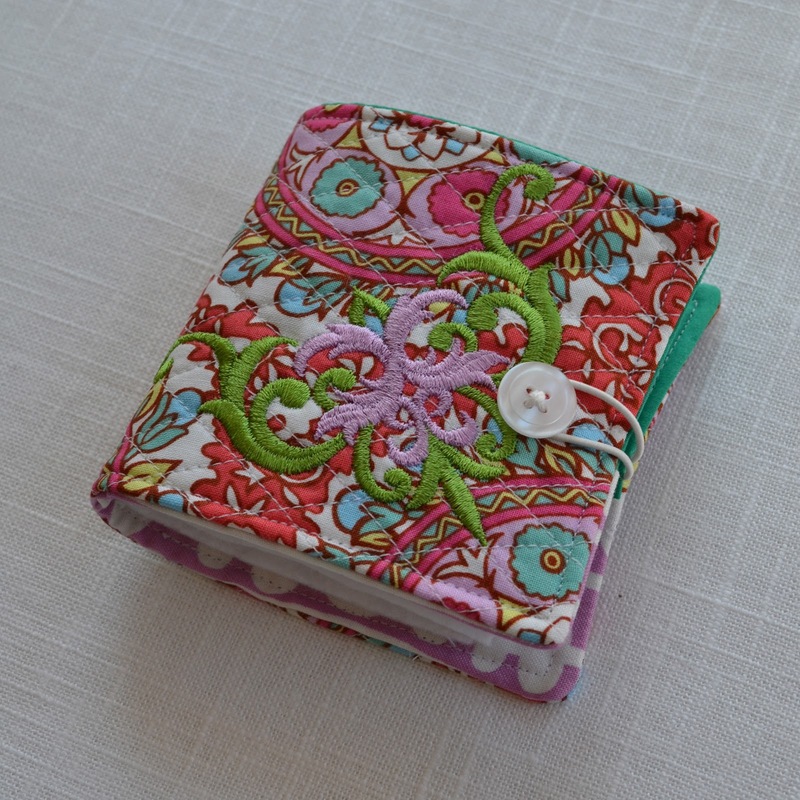 I have just made this little needle book for a friend for Christmas and it turned out wonderful! This is so cute, and functional! What a great tutorial, too! Thanks so much for your beautiful project! Love it, love it, love it! It's exactly what I was looking for. My friends are going to get a nice surprise. Thank you for sharing. Thank you so much for this wonderful tutorial! I made one and it turned out just great! You are so talent!!!! Thank you for sharing this lovely project. Never too many photos on such tutorials. I finished this today. Made 2 mistakes and one mishap, lol, but it was my very FIRST sewing project!! The corners are bulky though, despite snipping them as you did, and I couldn't get them under my machine's foot. I managed but wonder how I could fix that next time. pattern doesn't download. looks like a rectangle. can you just tell us what those dimensions are? Thank you so much for an excellent tutorial. I've been looking for the perfect needle book and this is it!! Thank you! I make something every year for my girlfriends on MY birthday to give to them. I want them to know how important they are to me in my life. My question is the round material on the page 2 of the needle book? I'm not sure what it is for are how to use it. Thanks for sharing you talents with us. I loved all the photos. Never too many when you are learning how to do something for the first time.